Chicken-based QSR and fast-casual concepts have received some press as of late for laying down serious growth while so many others have struggled. 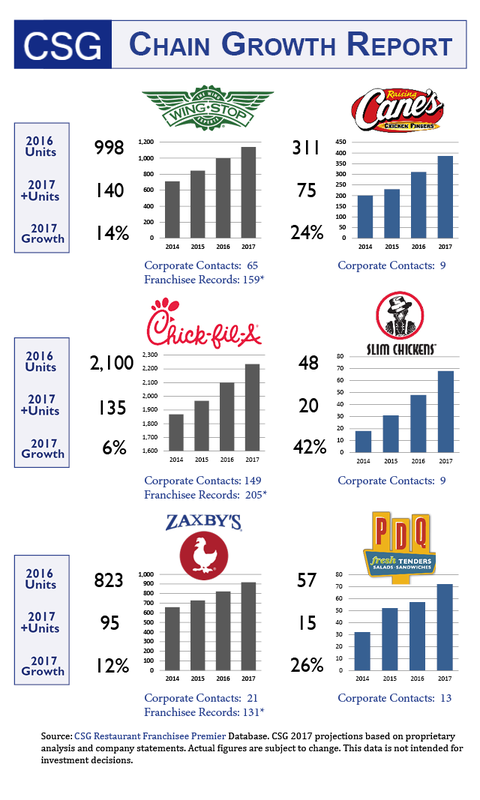 Turning to Chain Store Guide data and projections, as found in the Restaurant Franchisee Premier Database, we’ve assembled a growth report with six top chicken chains that should keep the good times going through 2017 and beyond. Of the six, three concepts have large existing bases of 800 to 2,100 units and plan to add another 100 or so each this year. The others are up-and-coming concepts that have their sights set on growth rates of 20 to 40%. * In addition to extensive corporate data and personnel listings for thousands of restaurant chains, CSG’s Restaurant Franchisee Premier Database now also contains data for individual multi-unit franchisees for the Top 50 restaurant chains in America. Looking at Wingstop, for example, database subscribers now have access to 159 US franchisees, including owners’ names and contact information – all part of CSG’s efforts to continue to deliver even greater value to our partners.